People come to the Smoky Mountains for a romantic getaway, and to get married, and to honeymoon. And they return frequently thereafter to celebrate their life with each other, and years later to renew their vows to each other, often with their grown-up children looking on, to everybody’s great satisfaction. You can get married almost anywhere in the Smoky Mountains, and the setting will be idyllic. And you can marry in any style you wish, from modest to extravagant, and either way make a memory that glows for a lifetime. Gatlinburg itself is the third most popular place in the world to get married. And a host of local people and enterprises flourish here to help lovers become spouses. You can get a lot of help with all the arrangements that a wedding entails. The numerous cabins nestled in the Smoky Mountains Cabins are one of its greatest features, especially for the romantic getaway and honeymoon. 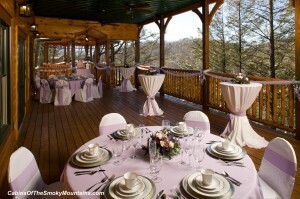 Cabins of the Smoky Mountains is the largest manager of luxury cabins in the area, with over 400 cabins. With 1-bedroom cabins alone we have more than 100 to choose from, with features ranging from breathtaking mountain views to secluded, tree-covered privacy. Most of our honeymoon cabins have a hot tub on the deck, and more than 30 have heart-shaped jacuzzis, for that final romantic touch! We offer our own wedding venue, a number of wedding and reception packages, as well as large cabins – up to 12 bedrooms – to accommodate as many guests as you want to join you on your perfect day. There are many chapels also nestled in the hills and valleys of the Smoky Mountains, for a traditional wedding in lovely surroundings. The ways and means of staging the marriage vary across a huge range, from limo to horse and carriage, even taking to the air by helium balloon for heart-stopping panoramic views of the Smoky Mountains. Be sure to see our informational page on How to Get Married in Tennessee. Also check out our selection of Smoky Mountain Wedding Chapels – including the “Drive-Thru I Do” service for mobile newlyweds with places to go!